When I’m fatigued with the stereotypical Goan party vacation, or I have friends visiting from out-of-state looking for the real Goa, I direct them to homestays. Staying with the local families, eating dinner with them while discussing their ancient ties to the state, is a way for us to sink into a typical Goan life like no other. A family-run homestay for the last 30 years, the Afonsos speak fluent Portuguese, English, French and Italian. The homestay, with a beautiful walkway and a rooftop terrace overlooking the St Sebastian Chapel, is an extension of their residence. I recommend this homestay to those looking for an authentic Portuguese experience coupled with Goan hospitality. It’s located in the old Latin quarters of Panjim, and there are many restaurants, bars and art galleries around. This is not the place for someone just looking for a beach to lounge at. They have air conditioned-rooms, and the rooms are clean and comfortable. Great for someone looking for a luxury experience on a budget. Located in Moira, this homestay built in 1804 has a blend of heritage with modern luxury that I love. The villa also has a pool to relax by, making this a great weekend getaway. It’s ideal for the person who appreciates architecture and design, with the resort itself yielding to many memorable photographs. They also have a well-stocked library. The homestay is close to a football ground which hosts tournaments weekly, which I love to drop by and cheer at. I also recommend nearby Cecilia’s Cart — near the panchayat office — for some chops to snack on. Price: INR 52,000 a night for the entire villa, can accommodate 12 guests. Located in the heart of Cavellossim, South Goa, the Siesta Villa has two luxurious bedrooms watched over by the friendly owner and caretaker. I recommend this place for its view. The rooms have stunning views of the Sal river. It’s also good if you’re travelling with a group of friends, since you have exclusive access to a living room, a dining room and a pool. This place has a minimum stay of a week. 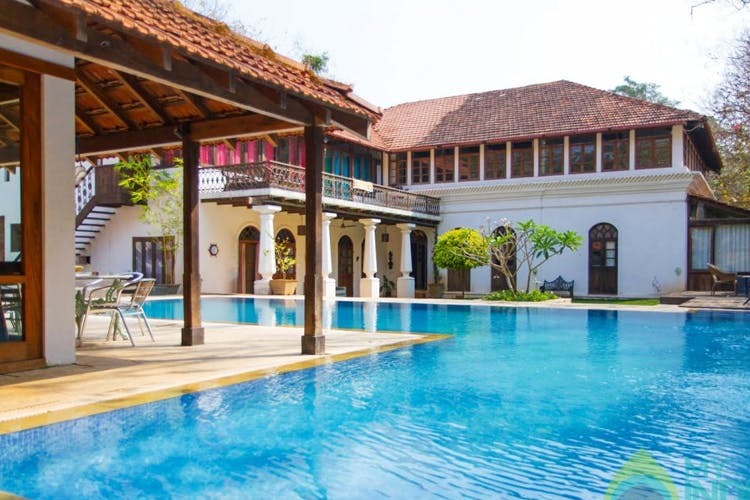 This villa in Gauravaddo, Calangute, is over a 100 years old. Perched on the countryside of the district, this villa is a kilometre away from the beach. This place is ideal for people who want a little bit of everything. It’s in a quiet area, which makes it perfect for relaxing, but it’s also two kilometres away from Baga Beach, so I can drop by to check out the tourists before retreating to my homestay. This homestay has slightly strict rules — no loud music after 11pm, and they’re sticklers for keeping the area clean, so be respectful of their rules. A no refund policy means that their rules are usually followed. Built in 1929 in the ancestral home of the Pintos, this homestay is right on the Candolim beach in North Goa. Overlooking Candolim beach, this homestay offers the kind of views I’ve usually only seen on postcards. A thatched roof, a private terrace overlooking the sea, and a walkway leading straight to the beach, this is where I tell people to go if they want to feel like they’ve escaped to an idyllic version of Goa. This homestay is close to the Florentine restaurant, which according to me has the best Chicken Cafreal in Goa. Also check out nearby Viva Goa for a fish thali lunch.